Microbial infections affect people worldwide, causing diseases with significant impact on public health, indicating the need for research and development of new antimicrobial agents. Animal venoms represent a vast and largely unexploited source of biologically active molecules with attractive candidates for the development of novel therapeutics. 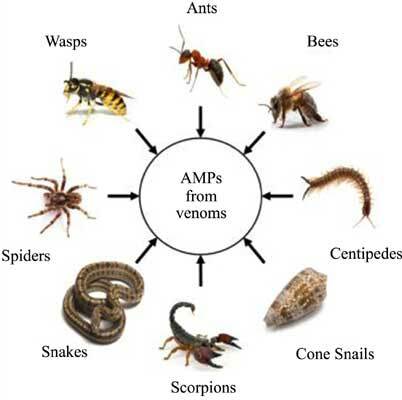 Venoms consist of complex mixtures of molecules, including antimicrobial peptides (AMPs). Since the discovery of AMPs, they have been studied as promising new antimicrobial drugs. Amongst the remarkable sources of AMPs with known antimicrobial activities are ants, bees, centipedes, cone snails, scorpions, snakes, spiders, and wasps. The antimicrobial tests against bacteria, protozoans, fungi and viruses using 170 different peptides isolated directly from crude venoms or cDNA libraries of venom glands are listed and discussed in this review, as well as hemolytic ativity. The potential of venoms as source of new compounds, including AMPs, is extensively discussed. Currently, there are six FDA-approved drugs and many others are undergoing preclinical and clinical trials. The search for antimicrobial “weapons” makes the AMPs from venoms promising candidates. Keywords: Microbial infections, Venoms, Antimicrobial peptides, Antibacterial, Antiprotozoal, Antifungal, Antiviral, Hemolytic activity. Keywords:Microbial infections, Venoms, Antimicrobial peptides, Antibacterial, Antiprotozoal, Antifungal, Antiviral, Hemolytic activity. Abstract:Microbial infections affect people worldwide, causing diseases with significant impact on public health, indicating the need for research and development of new antimicrobial agents. Animal venoms represent a vast and largely unexploited source of biologically active molecules with attractive candidates for the development of novel therapeutics. Venoms consist of complex mixtures of molecules, including antimicrobial peptides (AMPs). Since the discovery of AMPs, they have been studied as promising new antimicrobial drugs. Amongst the remarkable sources of AMPs with known antimicrobial activities are ants, bees, centipedes, cone snails, scorpions, snakes, spiders, and wasps. The antimicrobial tests against bacteria, protozoans, fungi and viruses using 170 different peptides isolated directly from crude venoms or cDNA libraries of venom glands are listed and discussed in this review, as well as hemolytic ativity. The potential of venoms as source of new compounds, including AMPs, is extensively discussed. Currently, there are six FDA-approved drugs and many others are undergoing preclinical and clinical trials. The search for antimicrobial “weapons” makes the AMPs from venoms promising candidates.